With a single announcement, Atlus has assured that I’ll be buying a PlayStation Vita at launch. The PlayStation 2 classic Persona 4 will be coming to the PlayStation Vita as Persona 4: The Golden with a few cosmetic changes, additional character voice-overs, and other features to take advantage of the new platform (more features after the break). Wireless support for calling on others to help you when you’re about to die in a dungeon. In an interview with Famitsu, SMT:P producer Katsura Hashino said that PE 4 was originally slated for the PSP. However, recounting the amount of content that they had to remove for Persona 3 Portable, Hashino decided to port everything onto the Vita to make sure that they’ll be able to fit as much content from the PS2 version as possible. Aside from Persona 4: The Golden, Altus will also be releasing a 2D fighting game called Persona 4: The Ultimate In Mayonaka Arena. This is slated for release on the arcade in Spring 2012, then for PS3 and Xbox 360 in Summer 2012 (no U.S. release dates yet :(). Altus will be working with Arc System Works, developer of the BlazBlue franchise to create a fighting game that features characters for both Persona 3 and Persona 4. 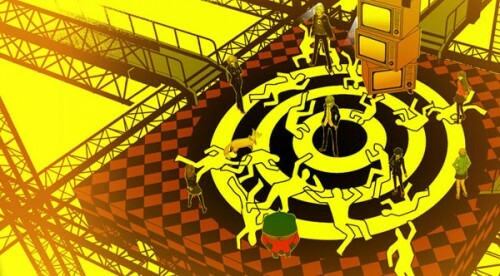 The Ultimate in Mayonaka Arena story takes place 2 months after the event of Persona 4. Oh, and Atlus has already hinted that there will be a Persona 5 so start saving.